"I would like to make a building as intellectually driven as it is sculptural and as positive as it would be acceptable to hope," Frank Gehry told Ross Miller over 20 years ago in Interview Magazine. Throughout the course of his career, the inventive architect has injected a heavy dose of imagination, tactility and potential into the world's landscape, in buildings including the Guggenheim Bilbao, Walt Disney Concert Hall and most recently the Facebook Headquarters. 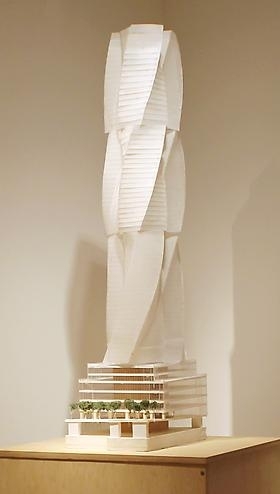 A new exhibition at Leslie Feely Fine Art will give Gehry fanatics a chance to examine his larger-than-life designs on a more approachable scale, illuminating the processes of his most iconic forms. The gallery will feature over 30 process models from 1985-2012, showing Gehry's designs in all their metallic, organic and playful glory. From a never realized tower for the Brooklyn Arena to an evolution of the concept for the Sonderborg Kunsthalle, the featured models present an a succinct tour of Gehry's singular creative process.